Traffic Alert and Collision Avoidance System (TCAS) False Target due to improper suppression circuitry interface. An operator reported a high rate of “false target” displayed on TCAS system. 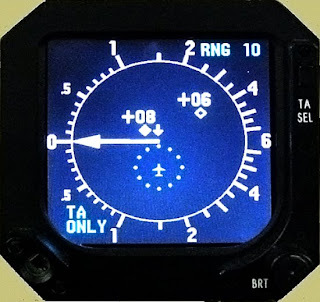 The “false target”, either a resolution advisory (RA) symbol or a traffic advisory (TA) symbol, would be displayed on the “nose” of the airplane symbol on the electronic horizontal situation indicator (EHSI). Troubleshooting revealed that the suppression system coax cable contact in the rack connector had been recessed too far from the face of the connector to allow proper mating with the TCAS computer suppression jack. This allowed the TCAS computer to talk to its own ship transponder, resulting in the TCAS seeing itself as an intruder. Investigation into the assembly of the connector revealed that the coax cable wire tripper would sometimes remove too much dielectric. This would prohibit proper insertion of the contact into the connector, causing some contacts to be too recessed and falling outside of the 0.192 inch requirement as measured from the front of the connector. This condition has been corrected by reprogramming the wire stripper to ensure correct wire exposure. In addition, a method of verifying proper contact insertion was added to the Boeing assembly drawing D6-5456.